Auger Loizeau, in collaboration with Reyer Zwiggelaar and Bashar Al-Rjoub, describe their smart-home project Happylife. It monitors facial expressions and movements to estimate a family’s mood, displayed via four glowing orbs on the wall, one for each member. We built a visual display linked to the thermal image camera. This employs facial recognition to differentiate between members of the family. 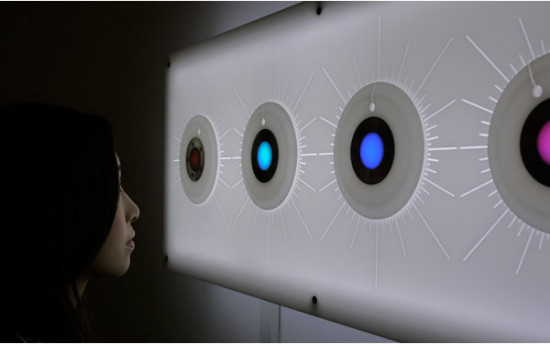 Each member has one rotary dial and one RGB LED display effectively acting like emotional barometers. These show current state and predicted state, the predicted state being based on years of accumulated statistical data. It was that time of the year. All of the Happylife prediction dials had spun anti-clockwise, like barometers reacting to an incoming storm. we lost David 4 years ago and the system was anticipating our coming sadness. We found this strangely comforting. (to read the rest, click here).